When the new family of three arrived at the studio the morning of their session, Brandon was wiiiiiiide awake. This is totally okay! I love awake babies, as long as they’re calm - which Brandon was. He had such bright eyes and a very steady gaze, and even showed off his cute little dimples for me too! 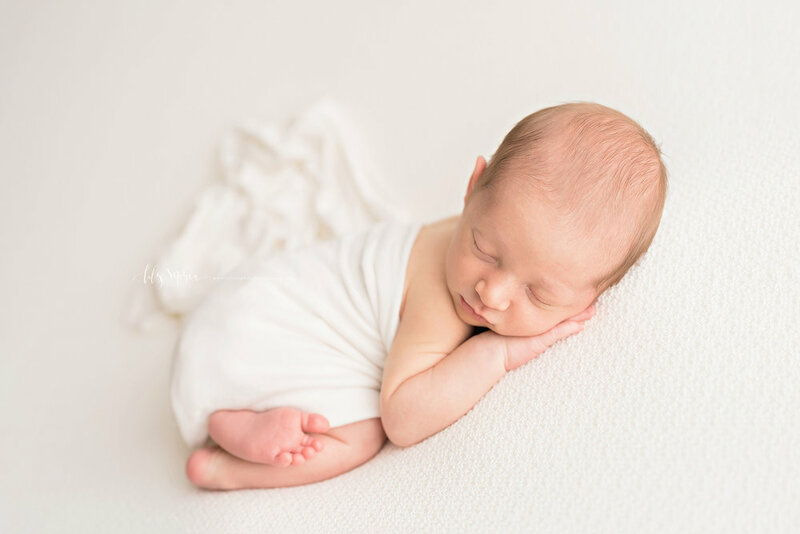 I took as many images as I could with him awake and calm, and then held and shushed him until he fell fast asleep. Once he was asleep, he was OUT. 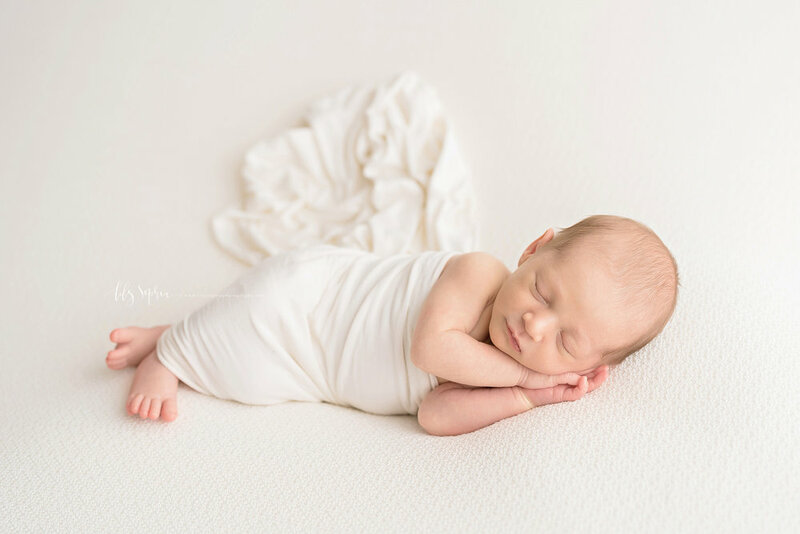 I was able to move through the rest of his solo portraits pretty quickly, and then took him out to Ashley for a diaper change and to eat. 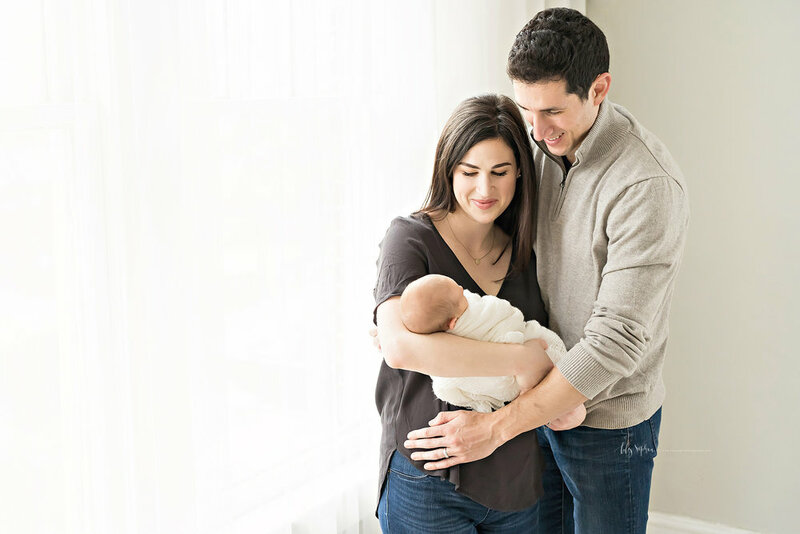 While Brandon was nursing, I chatted with Marc and Ashley and got caught up on their lives since I hadn’t seen them since their maternity session! 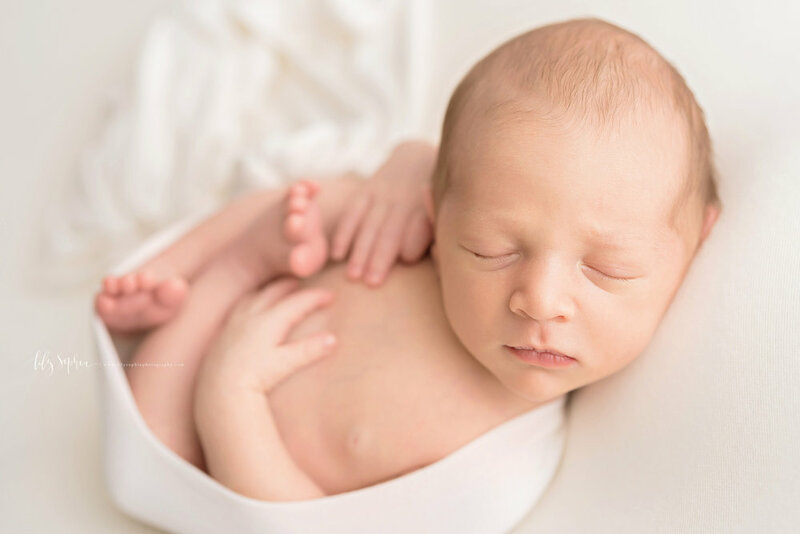 I love hearing labor and delivery stories and how those first weeks of parenting are going. Marc confessed that he didn’t know what the word “tired” really meant until having a baby… and coming from a guy who has to stay awake for long periods and be on call for his job, that’s saying something! Pro tip: the lack of sleep will eventually pass. Don’t listen to the negative Nancys who tell you that you’ll never sleep again - it’s a lie, because you will at some point! Ashley had brought along a casual black chiffon top to wear with jeans and asked if it was okay to wear. Absolutely! While we have a studio wardrobe available, there is no requirement to use it. The only thing I care about is that you look and feel beautiful… and that you’re comfortable! So whether that’s a white lace dress or jeans with a white t-shirt - that’s up to you. Your images will be beautiful and unique to who you are regardless. Once Brandon had a full tummy, he snuggled up to his mama and fell asleep again. We moved through the rest of the session pretty quickly. 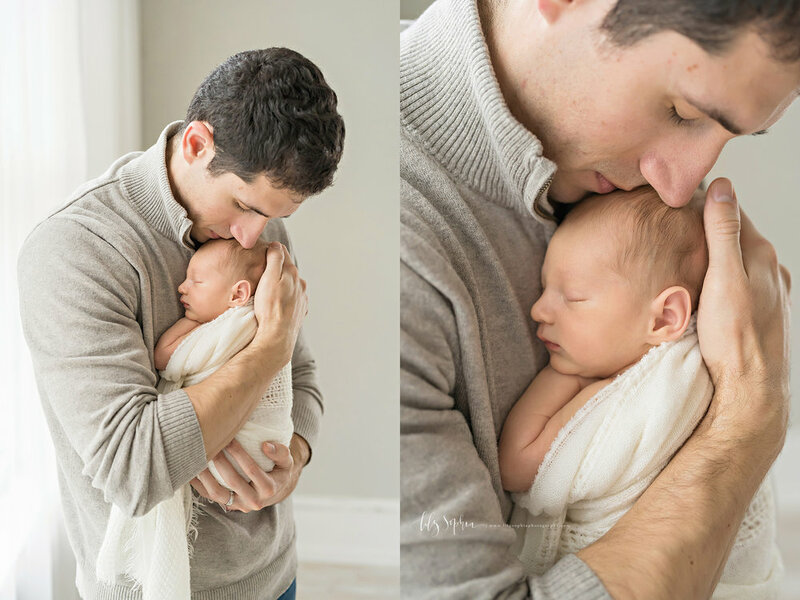 I loved photographing Marc with his little boy, because he’s one of those men who has settled into his role of dad so comfortably and his love for Brandon was so evident on his face and tenderly he held him. Sometimes during newborn sessions when I’m photographing dads with their new baby, I look back at mom and can see the love and pride shining in their eyes. We added in Ashley for some family images and then ended with just Ashley and Brandon. Ashley has such a calm and confident demeanor, and her love for Brandon was just as evident as Marc’s. What a lucky little boy Brandon is with parents like his! Have I mentioned I have the best job in the world? It’s really such an honor to photograph such a monumental time in my client’s lives as a brand new family! I really can’t think of anything better. Enjoy a few of my favorites from this session!